Reddit asks for proof that you are who you say you are. Here it is. 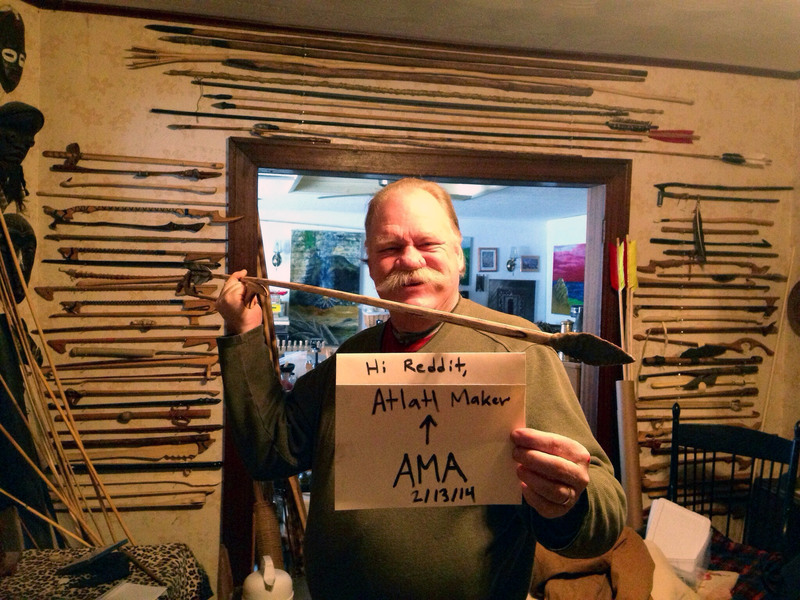 This past Thursday I did an “Ask Me Anything” on Reddit: I am an Atlatl maker. I make ancient spear throwing weapons for a living. AMA! 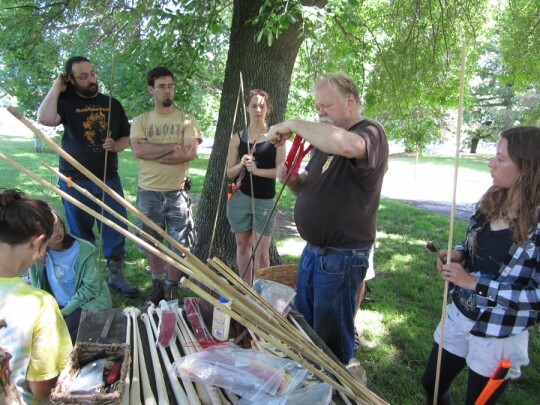 How did you get started making atlatls? Are there any competitions involving them? It started as a hobby. As a boy, I found an arrowhead in a field and I’ve been interested in archaeology ever since. I was working as a carpenter about 25 years ago and made a few atlatls in the shop for fun, and it gradually turned into a business. There are a lot of Atlatl competitions. There’s a World Atlatl Association that organizes the “ISAC” events (International Standard Accuracy Competition). It’s a standardized competition format and people all over the world compete in it. You can probably find one nearby where you live. Each atlatlist gets ten shots, five at 15 meters and five at 20 meters, and the maximum score is 100. So far nobody has reached that pinnacle, but several people have come very close… I believe 98 with five X’s (bullseyes) is the all time top score. 1) How hard is it to live in the shadow of such a glorious mustache? 2) With proper training, how accurate can you be with an atlatl/dart versus a) throwing a spear or b) bow and arrow? 1) I’ve had my mustache since I was a boy, so I don’t know how to live without it! 2) Spears (and by spears, I mean big, heavy hand-thrown spears the size of a broom handle) have a lot of power but they don’t have a lot of accuracy and you can’t throw them very far. Atlatls are much more accurate than spears at any range. 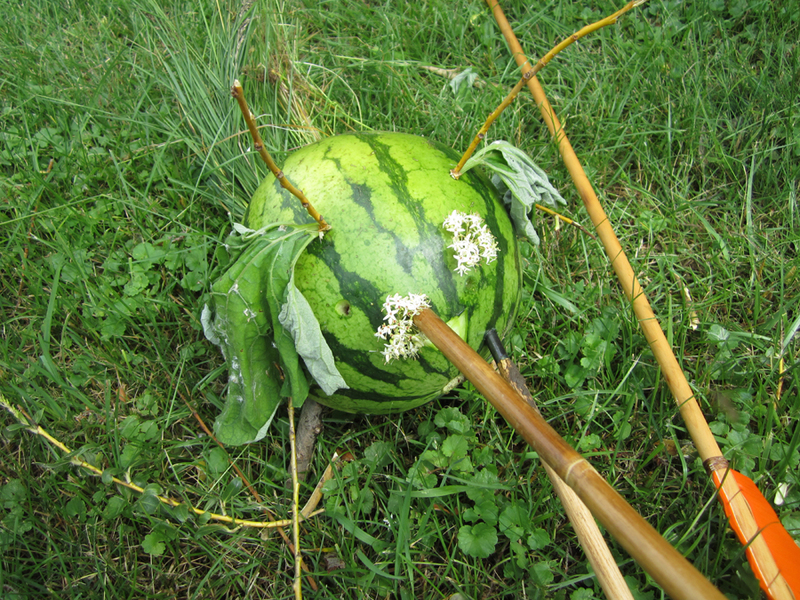 As for the bow/arrow — Atlatl darts are like giant arrows. They’re 3-10 times the weight of an arrow, but they aren’t nearly as accurate as an arrow except at short ranges like 10-20 meters. A lot of atlatlists are almost as accurate as archers at close range. But if you get a good hit with an atlatl dart, it will have MUCH more killing power. Force is mass times velocity squared, so if you have a dart that’s ten times the mass of an arrow and flies at half the speed, it will have substantially more killing power. For instance, if you throw a dart that’s ten times the weight of an arrow at half the speed, it will hit the target with two and a half times the force of the arrow. Force is mass times acceleration (which is velocity per second). That being said half the mass times velocity squared is kinetic energy which is a useful value for projectiles. You are probably right. In any case you can use these formulas to calculate the relative energies of atlatl darts and arrows. Hello Mr. Berg. Have you heard of Roderick Laird? He’s my grandfather and he’s really into atlatls. He started an annual atlatl competition in Wyoming and it still happens without him every year. He taught me how to throw and is an overall brilliant man. Thanks for the ama! I think Roderick Laird is one of the heroes of the modern atlatl movement. 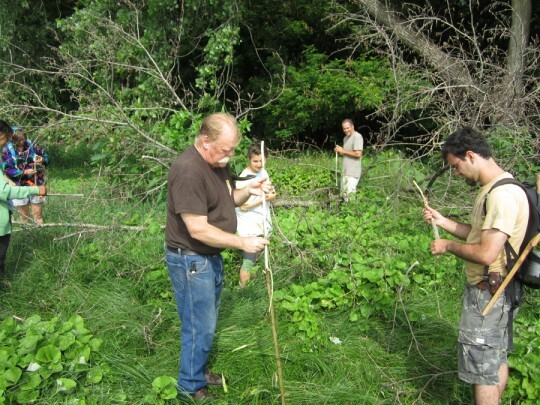 Bringing the atlatl out to be enjoyed by the general public has been a phenomenon that was started by those early atlatlists that continues on today. I also would like to mention the names Leni Clubb, Lloyd Pine, W. Carl Fry, and W.R. Perkins (Atlatl Bob who is not me!) as well as Zelia Nuttal as atlatl enthusiasts who also were early contributors to the atlatl world. What’s the farthest you can throw a dart with an atlatl? Some people are able to throw specialized tiny, light darts at tremendous distances as far as 250 meters. But that’s not a typical situation. The atlatl is primarily a short-range weapon and works best at 10 to 30 meters with any degree of accuracy. Atlatl darts are much heavier than arrows, so they don’t fly as far…but the extra weight of the dart makes them much more deadly. As for me, I can throw my 3 oz bamboo darts about 80 or 90 meters. I can usually throw my 8 oz wooden darts about 50 meters and my 6 oz darts about 65 meters. These long, heavier darts are designed for hunting and accuracy, not distance. I’m impressed that you can kill fish with a thrown dart. How does that work? Do you wade in the water, or do you need a higher vantage point? You have to aim below where you see the fish in the water to take account for the refraction. I usually dip the tip of my dart into the water and note the angle of refraction to get the angle in my head, before I take any shots. I don’t have a question, but I bought an atlatl set from you years ago at Chimney Point. I just wanted to say that you guys are awesome. Your customer service has always been great and you make great quality equipment. Keep up the awesome work. 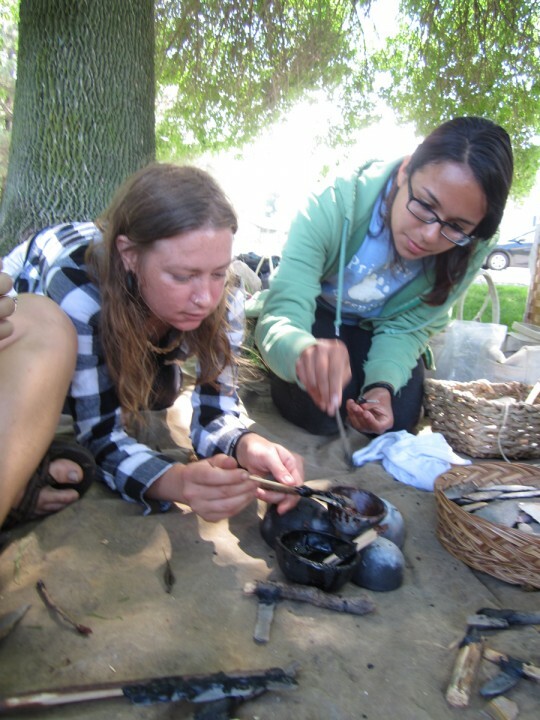 Do you do the flint-knapping yourself? Yes. I am an avid flintknapper. I’ve been doing it for over thirty years. 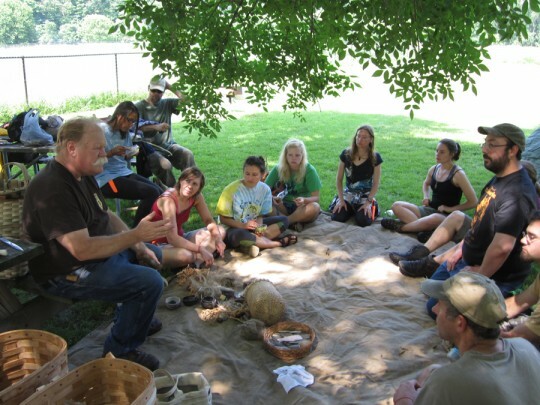 I’ve taught workshops here and in Europe on how to flintknap and how to use tools made from flint to make atlatls and darts the traditional (primitive) way. How accurate are they? Is it something you’d have to throw at the same time as a bunch of other people in a battle? Atlatls are not very accurate at long distances, but if you had a whole group of atlatlists throwing at once, you could do a lot of damage. Nothing to ask, but I just want to say I have used your atlatls and darts numerous times in my presentations in Texas State Parks. you make some damn fine atlatls, and I wish I could buy a ton more. Also: Thank you so much for that Y-rest on your atlatls. So many kids don’t have the hand-eye coordination to throw without it. It’s a totally great idea. How much practice and training did it take until you were ready to hunt with an atlatl? When you hunt large game like deer, is your range relatively short or would you take a shot from 50 yards out? When I started training to hunt with atlatls and darts I shot about a hundred shots a day for several months. I knew of only a few other people who had ever tried atlatl hunting at the time. We got together in Vidalia, Georgia and spent a day just practicing together and also making up stone pointed darts. I hit the first hog I ever shot at. I used some pretty light darts and some stone points that I had made and carried in my pocket for a few days. They rubbed together and dulled the edges so the combination of dull point and lightweight dart caused poor penetration. It also hit the scapula bone so I did not get the pig. Live and learn. I experimented for more than a decade to get to the point where my skills and equipment were good enough to make me confident at atlatl hunting. At the time I did not have the benefit of being able to ask someone else who had the experience. 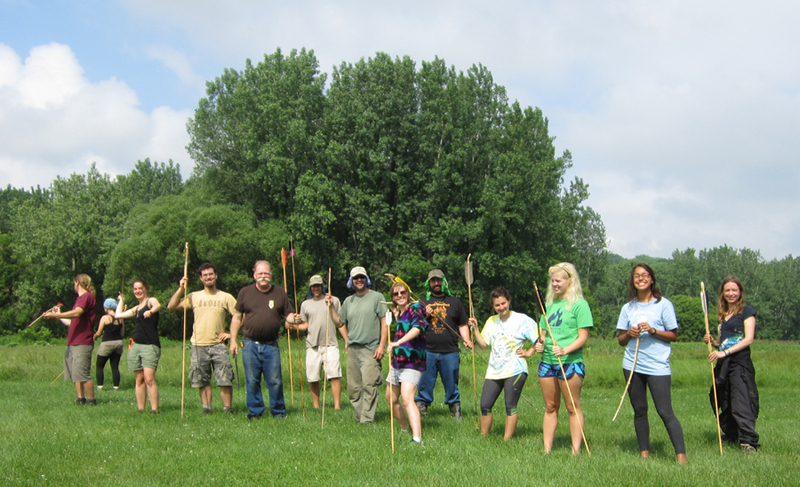 There was no one around with atlatl hunting experience that I could go to so we had to figure it out ourselves. We are still doing it, although we are much better at knowing what works today. I guess that since a few states have begun to allow atlatl hunting our work has not gone unrewarded. What kinds of people buy atlatls? Collectors wanting a novel item in their home, or people who actually plan on hunting with them? I’m going to say that men are my usual customers but women buy and enjoy them too. They are often bought by people who like out door activities and competitive sports. We find that many groups like Boy and Girl Scouts, church and summer camps , 4 H clubs. school and college clubs, survival clubs, and hunters and fishers like to buy and use them. Youth will gather at the range and practice with atlatls for hours with great delight and ever growing enthusiasm. Bought my atlatl from you at Hammonassett State park here in CT this past summer…thanks again for the help and the great product. How often are you called upon to produce atlatls for museums and educational displays? Almost on a weekly basis. I make lots and lots of atlatls, from modern ones to museum quality replicas and for archeological experimentation for universities and researchers. Hi Mr. Berg, I was wondering if you had any good hunting stories to share? What’s the biggest animal you’ve taken down with an atlatl? Thanks very much for doing this AMA! I was just wondering if your designs are slightly more modernized in terms of style and production or if they remain hand carved like many atlatls. Thanks again for the AMA! Most of the atlatls I make are modern interpretations or new atlatl designs rather than reproductions. I do however make atlatls that are made in the styles that they find in the archaeological record when they are requested. I have made a few atlatls and darts for my own edification. I gave a set to my great nephew who thought it would be a great/inexpensive sport for his school. Whaddya think? I think that atlatls are a really cool way to bring several different subjects to school kids in a way that will capture their attention and hold it for a long time. 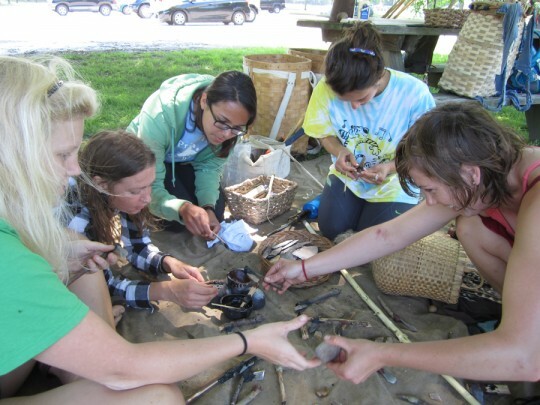 You can connect archaeology with physics, history, sculpture, art, and physical education, all with something you can make from sticks and stones. As a school sport, it would be quite good I think. You could have intramural competitions or challenge other schools to competitions using the ISAC (International Standard Accuracy Contest). What interested you about atlatls so much that you decided to take up the craft and turn it into a living? Making atlatls and darts has been an all consuming process for a couple of decades. I would say that it is just more interesting to do than having a “normal” job. I like to advise people that if you don’t enjoy your job, it is difficult to enjoy your life. What kind of range and accuracy would you expect from someone skilled with an atlatl, compared to a spear thrown by hand? I’ve always been curious about that. Is it like an NFL quarterback 60 yard pass kind of spread? Or like launch a bunch of bottle rockets from a pvc for 200 feet kind of spread? 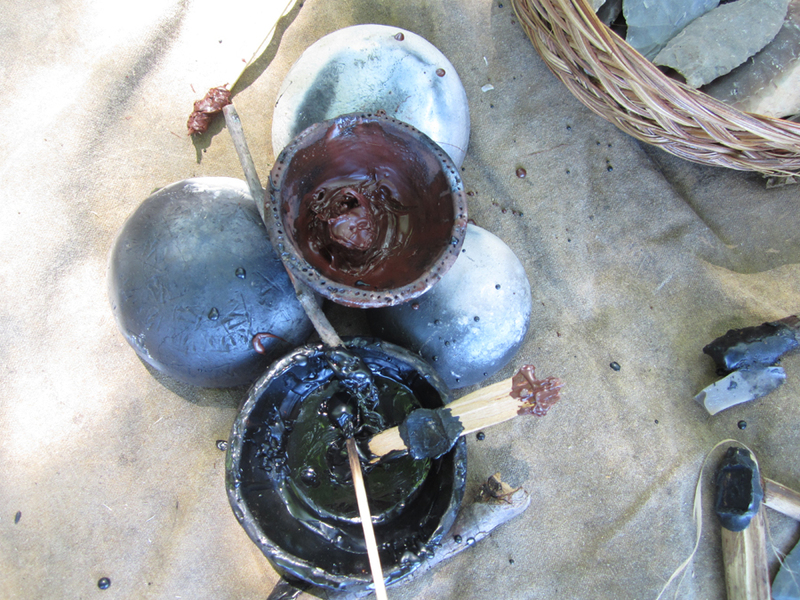 My experiments with heavy hand thrown spears and atlatls show the atlatl to cast a dart about 3 to 4 times farther and with much greater accuracy. It all depends on the gear you use in the experiment and the skill of the thrower. I would guess if an NFL star quarterback did the experiment he would throw both of them better than I do but there would be the same difference between the heavy hand thrown spear and the atlatl cast dart. I was doing some research over the summer, and I came across a picture of an atlatl used (I think) in PNG. It resembled an oar and could be used to paddle in canoes. Any idea of the tribe that made these? Have you ever made one? Are they effective? Finally, do the “counterweights” used on atlatls make a huge difference? I work with UP material from Central Europe, and we NEVER find them. I would guess that the picture depicted a woomera made by Aborigines from Australia. Yes I have made some of them. I tried using the wide style of woomera. I have better luck with other designs. Counterweights work well to balance out the weight of a dart that is made in such a way that the majority of the mass of the dart is in the first third of it. If you were to throw darts with large stone points there is an advantage to using them. Makes sense. Do you make your atlatls using stone tools? I teach workshops that focus on making first a tool kit of stone tools, and with them an atlatl and some darts. But the truth is that we make most of our atlatls in a wood shop using normal wood working tools and skills. Yes, but the atlatls that I normally sell are made in our wood shop. Thanks for the AMA! My wife and I just saw a short special on local PBS about atlatls, and she can’t stop saying it! 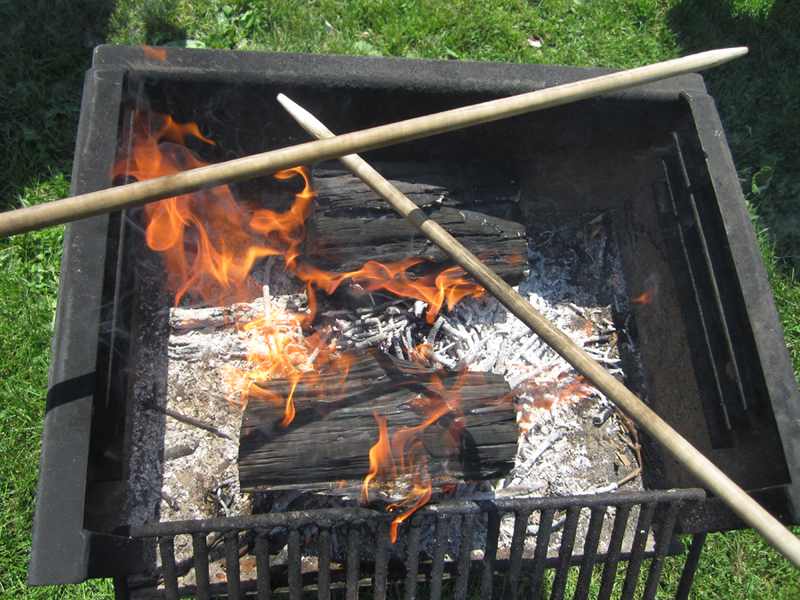 Have you experimented with any modern materials like carbon fiber, or metals like aluminum for the atlatl? I’m assuming darts already can be had in those materials? I personally prefer traditional materials like wood and bamboo. There are makers of darts made from modern materials but somehow that goes against grain for me. I think the best material for darts may be bamboo. and wood comes in a close second. There is a certain aesthetic quality that exists with wood and bamboo that just can’t be matched with aluminum or fiberglass. This. This is a thing I’ve long felt I needed in my life. As this is the third time they’ve come up lately I think it Must Happen. Questions! 1) I saw a guy fashion and (poorly for various situational reasons) use one on the survival show Dude, You’re Screwed. Have ya seen it? 2) obviously anything physical takes practice to learn, but about how long/how much practice would you say it takes to use one fairly efficiently. 3) Are these still used in South America, currently? Learning how to use an atlatl takes a few minutes, but to learn to use it well takes a lot longer. It is a matter of developing an effective throwing technique, then developing the muscle memory and hand to eye coordination. It takes some people longer than others to learn this. It took me a few years. I’m still learning. I think the closest analogy would be learning to play golf. I believe atlatls are still being used in South America. Although many of my atlatl designs are modern, I prefer to use natural materials such as wood, stone, bone, antler and bamboo in my work. It is a personal choice not based on any cultural or archaeological imperative. I think woomeras were designed as a multi-tool. Most North American designs were based on function. Many of the ancient European designs had more or less a degree of art incorporated into their designs. My nephew was really into atlatl’s when he was growing up. If I’m correct, the Anasazis used this devise as well, correct? Atlatls are sick; is there a good set of instructions on how to build one? I got to use an atlatl at my Boy Scout camp once. Are there any competitions with them? Like distance or accuracy for example? Yes, there are many atlatl events. They are listed on the World Atlatl Association site under “events”. I understand that there is a community around this object so it’s possible to get instructions for building and using them, but in the large gap between when they were popularly used and in more modern times when there’s been a re-ignited interest, how did this knowledge survive? Are there written accounts of how to build and use these from long gone times? Were there actual artifacts of these weapons found, or are the current weapons our own interpretations of the instructions? Were they passed down through native populations that still survive on the fringe of society? Yes there is a community of atlatlists who have shared ideas and knowledge with each other. Because of the gap between ancient users of atlatls and modern users I think a great deal of information was lost. We have regained a lot of it through a process called experiential archaeology where the known artifacts are puzzled into actual experiments with the object of trying to discover the missing information. I think the rebirth of the atlatl is an outstanding example of this kind of science. It may actually be more art than science in the end analysis, but to say much has been learned would be an understatement.